"The bikes looked stunning and quite a few were used on the road with dealers fitting Bates lighting systems, silencers and double seats as the customer demanded. This is how mine arrived back in the UK, the previous owner having owned it since 1985. It had obviously had a hard life but had all the right bits, original frame and engine numbers and a fantastic patina that I didn’t want to ‘restore out’. First fire up - smoking like a trooper - but runs well and feels smooth. I decide to strip the whole bike and check it over. The frame is bent, obviously having had a front end bump at some time and is packed up and sent away for straightening. This in itself is a problem as the company is 200 miles away and if this frame goes missing the bike becomes a jumble of bits with no real value. So the frame has to be hand delivered by a man with a van. Let the spending begin. The fork stanchions are also well chewed up and corkscrewed, so a new pair were sourced from Roger at Cake St Classics. The sliders however were a slightly more difficult project, needing oversized bushes turned to fit into the ovalized interiors. The wheels were good having the original WM2-19 and WM3-18 Jones rims. The chrome has some pitting but with a bit of wire wool and WD 40 they cleaned up a treat. I fit new bearings and have the finned Catalina brake drums spun up and skimmed on a lathe to true them to the relined shoes. A pair of Dunlop K70's and they look ready for the rutted English roads. With the rolling chassis complete I move onto the engine and gearbox. Mains and big ends are perfect but a rebore is needed and a pair of superb Wiseco 9:1 pistons are fitted, again from Cake St. New valves, springs and gaskets and the engines together. New primary drive chain, clutch outer drum and plates are fitted along with an increase in the size of the engine sprocket from 21 to23 teeth. These scramblers were fitted with a STB close ratio boxes as standard for off road use and therefore need a few extra teeth to stop them topping out at 50 mph. Once the box was rebuilt and fitted with the engine and primary drive in the rolling chassis, I moved on to the cosmetics. I was trying to keep the bikes patina and wanted to fit as many original parts as possible. 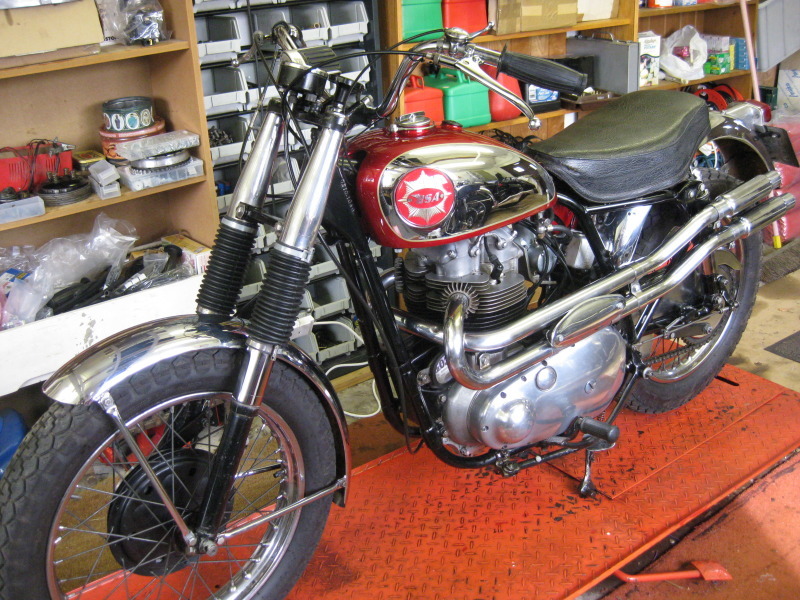 When it arrived it was wearing a Siamese exhaust, 7" Lucas headlamp with ears on the fork shrouds, a toolbox and double seat. All these had to go in the bin, and I started the search for the original parts. The single scrambles seat! Impossible, I thought. My first contact, Dave Ashton - a great engineer, who has helped me enormously with this and other projects - says “I think I have one of those in the shed” Amazing! Then searching on Ebay USA, I find a pair of original ear less chromed fork shrouds in Washington, worn but perfect.